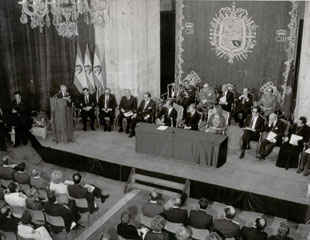 The twenty-fourth of September 1980 is a date that has special significance for this Foundation, considering that, in the Reconquista Hotel of Oviedo and in the presence of the then Prince of Asturias, now King Felipe VI, who was accompanied by his parents, Their Majesties King Juan Carlos and Queen Sofía, it culminated with the ratification of this Foundation's establishment proceedings. In the Covadonga assembly room of that Hotel, the President of the Caja de Ahorros de Asturias (Savings Bank of Asturias), Adolfo Barthe Aza, who presided over the Foundation's Supervisory Commission, opened the solemn act by expressing his gratitude for the presence of the members of the Royal Family, for whom he desired that "the Foundation, from now on, be his second home"
Following this, the notary public José Antonio Caicoya Cores read an excerpt from the Charter, underscoring the Foundation's aims, among which the connection of the Heir to the Crown with the Asturian region must be mentioned. He finished by stating to all those present that His Royal Highness had accepted the proposal of being named Honorary President of the Foundation. Professor Emilio Alarcos Llorach, member of the Royal Academy of the Spanish Language and full professor at the University of Oviedo, then explained, on behalf of the Foundation, what it consisted of and what could be expected of it, requesting that everyone should unite their scattered forces and channel them towards the established objectives. "The land of Asturias is a favourable area for enthusiastic enterprises. Yet it is also the land in which the joyous beginnings are, sooner or later, insensibly snuffed out, either due to the adverse reactions of the incredulous surroundings or because of the gradual tiredness of the promoters. We hope that it will not happen this way for the Foundation. The optimistic desires of its creators endeavour to stay clear of the stagnant waters of apathy, envy, inertia, and disenchantment. In order to do this, the disperse forces of many people must be joined together and skilfully channelled behind the driving purpose: the cultural development of Hispanic peoples. Because if the Foundation is Asturian, the fruits of its labour must not be limited to the territory of Asturias, but rather, fleeing from small-minded localism, ought to reach all Hispanic areas. Herein are two typically Asturian features: no one more fond of his homeland and of his own traditions than the Asturian, but no one less willing to see its projection be limited to the region where it originated from. The Asturian, as it was said of Clarín, is a universal provincialist". The deputy general and member of the Royal Academy of the Spanish Language, Manuel Díez Alegría, then took the floor in order to deliver the keynote address. According to his remarks, the ideal time had been chosen to create the Prince of Asturias Foundation. "Over the course of its history, - he said, - Asturias, that silently and uninterruptedly kept its humanistic values, has sporadically come to project them onto the larger frame of our native land, and this fact is especially evident in those periods which we may refer to as the transition". "You can be sure, young Sire, that upon acceptance of the honorary presidency of the Foundation that is safeguarded under the name of your Principality, you will have climbed one step higher in the hearts of the Asturians, that regard it as a tie that joins you more solidly to us, and under such high patronage we are soundly convinced that, upon complying with the aims which originate it, our region, so full of singular historical sources, must again feel that it is successfully contributing to Hispanic culture, considering that in Spain it always put forth its eagerness and its grandiose desires". Following this, King Juan Carlos adjourned the session, thus concluding the protocol proceedings to the constitution of the Prince of Asturias Foundation. Afterwards, the then King and Queen of Spain and HRH The Prince of Asturias were treated to a gala dinner offered by the Foundation, in the company of numerous national and regional personalities as well as attendees from Latin America. The finishing touches to the day's events were applied by a musical performance featuring the University Orchestra, the tenor Joaquín Pixán accompanied by the pianist Vázquez del Fresno, and the University Choir of Oviedo.